← Prevention in Pakistan: Cameron’s new strategy? 8 Days in Seoul with Images. India’s Dream City? I was nagged by one question throughout my recent holiday to Seoul. Why does South Korea remind me so much of India? But of an India without slums, heavy pollution, child poverty and endemic corruption? This is a personal write up of my trip. There’s a full photo gallery of my own pictures at the end, featuring many of the locations. Born to Indian parents in Britain, I’ve watched India’s transformation through my regular visits with fascination and sometimes great sadness. Both countries are proud nations with strong armies, amazing cuisines, powerful movie and music industries within South Asia and perhaps the richest and oldest living cultures in the world. My trip to South Korea was actually organised by my children’s Tae Kwon Do teacher, a Korean ex-Marine; so we saw plenty of martial arts displays, went to meet Tae Kwon Do Missionaries at Church and met serving Marines taking part in a military display. Both their modern states were forged out of a brutal fight for independence against occupying colonial powers. In India Gandhi led a peace-based movement, while Subhash Chandra Bose led a violent revolutionary army against the British, that allied with Hitler and the Japanese during the Second World War. The Japanese — whose influence in Korea grew rapidly at the end of the 19th century — deposed the long Joseon Dynasty in 1910, (imagine the Plantagenets ruling Britain right through till then) and their 35 year occupation was marked by a campaign to attempt to eradicate Korean language and culture, and a brutal suppression of the Korean independence movement. The Seoul prison where many activists were tortured to death is a major memorial, though the exhibition, apparently fails to mention that it was also used to hold student activists during South Korea’s the violent military rule of the 80s. On Korean Air, the classic Hollywood film selection always appears to include at least a couple of WW2 Actioners about the Japanese defeat in the Pacific. Historical dramas about the golden age of the Joseon Dynasty are big ratings pullers. Statues of major heroes such as General Yi Sun-shin, (South Korea’s Admiral Nelson) who repelled the Japanese with his technological marvel — the turtle ship — are a striking presence on the boulevards, in parks and museums. There’s a magnificent replica in Seoul’s Korea War Memorial museum. The same 5 star hotels and Western brand names dominate the down towns of big cities like Seoul and Mumbai. Localised coffee brands are taking on the behemoths of Starbucks and McDonalds. (You can get a sweet potato latte in Hollys Coffee.) In India similar entrepeneurship lies behind success stories like VG Siddhartha’s Coffee Day cafe chain. While I was in Seoul, its fanciest hotel, The Shilla, named after an ancient much mythologised kingdom, even featured in the kind of row that India specialises in: A well known designer of Hanboks, Korea’s graceful national dress, was refused entry to the hotel’s famous Sunday buffet. The Hanbok, it turned out, was banned, as were tracksuits. Then the hotel claimed wealthy (and foreign) guests had apparently complained about tripping on them. It was a health and safety issue. As politicians and celebrities got involved to condemn the policy, the hotel quickly backed down and there’s been much public bemoaning of South Korea’s alleged lack of cultural pride. But these are the differences. The big ones: While so much of India’s rich cultural heritage survived, admittedly with all the jewel inlays prised out of some palace walls by various invaders (eg. Delhi, Agra, Lucknow) much of it decays under heavy air pollution, poor maintenance and indifference. It infuriates Indians and foreigners alike. In Seoul, where fire did not destroy, the Japanese often did. But as you travel around the city you find every surviving stone or gateway lovingly restored and carefully labelled with a National treasure number. One assumes not that many have survived. At the Deoksu palace in central Seoul, the small site that remains moved me greatly. Apeing Western style, while under pressure from strong trading interests, the last Joseon emperor built a salon to receive Western dignitaries furnished with electric lights and other “modern” fittings. It looks wretched compared to the simple elegance of the rest of the buildings. The link above shows photos as well of the Classical style buildings he added, giving valuable commissions to European architects, furnished apparently from Maples of Tottenham Ct Rd. Like India’s Mughals, Korea has a great history of ancient scientific achievement. In the grounds of Deoksu palace National Treasure number 229 was particularly moving. Just a couple of large vessels and small bowls had survived of the world’s earliest automated water clock or Chagyeongnu/Jagyeongnu, that could strike gongs and ring bells. It was commissioned by King Sejong in 1434. A replica’s been made. Next to it was another example of Korean technological innovation — the Singeon — the first weapon for which a blue print exists. It’s a 14th century multiple missile launcher, that could fire more than a hundred iron-tipped bamboo arrows, with paper gunpower-filled rockets attached to the rear. The fuses would all be grabbed and lit at the same time. There are more excellent models in Seoul’s Korea War Memorial museum. Perhaps most symbolic of South Korea’s success has been the reclaiming of the Cheonggye stream, which runs down the centre of Seoul. Reduced to a covered over slum by the early 20th century, not dissimilar one imagines, to the historical Fleet river and other Thames tributaries now covered up by London’s eponymous streets, in the last 2 years Seoul has turned it into an urban park; slightly sunken below street level, and landscaped with grasses, benches, sparkling fountains and lights at night. A sunken version of New York’s similarly recent High Line reclamation, on a disused elevated railway track. In the summer it’s contributed to lowering Seoul’s sweltering humid temperatures by 10 percent, directing cooling breezes over the city. During the day and night we watched families, joggers, teenagers and courting couples share its space. One night our children watched fascinated (and nervously) as a young airforce officer in apparent dress uniform negotiated his way over a waterfall by stepping stones, one hand holding onto his girlfriend’s, the other a black attache case, which we speculated contained important military secrets. Could such a scheme ever work in India? How much funding would municipal and contractor corruption siphon off? How soon before the stream, flowing with fish whenever we walked along it, was clogged up with rubbish and human waste. It wasn’t that I saw nothing that troubled me. There were all too many fragile looking alcoholics and drug addicts around our hotel and in the parks. Many of them quite old; all of them begging and occasionally aggressive. But nothing that I haven’t seen around King’s Cross station in London. The street food stalls that set up along every major thoroughfare at night offered the same bargain delights as the many Indian cities I’ve been. There was mess, but it was cleaned up by morning. There were no children begging. As in India the proliferation of small scale trading is impressive: The arcades and various markets specialised by areas. Scores of stalls in mazes of souk-like streets competing to sell you engrave-able trophies or road traffic cones and lighting, cheap clothes, or mobile phones or cameras. Everything open till late at night. The sky scrapers and glowing lights of downtown Seoul could be Los Angeles. Up close they are properly finished and working. There are no slums on their doorsteps. But as we saw the grim high rise tower blocks where most Seoul-ites live, many commuting in on the extensive and clean train and subway network, I wondered about the social cost of South Korea’s economic miracle. For all the day trippers clad in the latest high tech gear that we met returning from a Sunday hiking up one of the beautiful mountains that surround the city, I saw all too many old women and men are working late at the 24 hour fish market, or sitting on the steps of subway stations selling small packets of vegetables, or toothpaste out of suitcases on the subway train carriages. Talking to Korean friends, who live near me in London’s Koreatown, New Malden, many agree that comparative “success” in Korea can be much easier here in Britain. Like India, where education is so valued, but there are big demographic pressures on the number of places available at prestige insitutions, the pressure to attain can have a terrible cost. Seoul’s KAIST university — one of the the nation’s most prestigious science insitutions — was hit by a spate of student and (1) staff suicides, after linking tuition fees to grades and insisting courses be taught in English, to boost the university’s international ranking. The Wall Street Journal has an interesting take on the story here. And South Korea’s Human Rights Commission is investigating. Out on the streets, chatting often to groups of South Korean school children, they seem very much like British kids; but with much higher grades and many more 6 year olds carrying smart phones. The value of education; the respect for elders remain strong in India and South Korea. Perhaps it is the scale of everything in India that makes it seem impossible to imagine it achieving South Korean levels of standardised affluence anytime soon. I wondered whether the caste system of the rich versus the poor (not just a religious one) that discriminates so powerfully against the have-nots, (so well explored in Aravind Adiga’s White Tiger), is too entrenched to overcome. India, like South Korea, lives with a real sense of fear about its nuclear neighbour, and in Delhi it can take up a lot of government focus; at the expense of dealing with poverty; especially since the 2008 Mumbai terrorist attacks; which of course targetted symbols of India’s affluence and success . In Seoul it’s sobering when you see every subway station has cabinets full of gas masks, and school children are drilled in how to act in case of a North Korean chemical attack. But municipal and central government money is still spent on social projects on a scale that makes a difference. Indian friends I’ve discussed my questions with say South Korea has had the benefit of 60 years of strong American support. It doesn’t have the sheer numbers that India is dealing with. A billion people. A huge agricultural-based economy. The endurance of feudal attitudes. Many who abandon the land for the city slum, it’s been argued, have escaped to a better life. As someone who remembers India’s strange and sometimes dark flirtation with socialist and particularly Russian alliances in the 1970s and 80s (the State of Emergency; more mundanely, the time you had to drink strange Indian imitations of unavailable American imperialist Pepsi and Coke) Korea’s close relationship with the US seems key. Though Seoul had its own dark period under an authoritarian regime well into the 1980s. While many nations took part in the UN led Korean War in 1950-3, (many British veterans are currently in Korea marking the 60th anniversary of the Battle of the Imjin river) General MacArthur’s strong leadership helped build great trust. America understood South Korea’s fight for independence. Japan plays baseball too, but South Korea’s relationship with America is based on a shared fight for freedom. Perhaps those extra decades of unwavering alliance have made all the difference. The tower blocks and war monument of Seoul can, seen from a distance, seem indistinguishable from similar ones in Communist-bloc Europe — like Berlin’s Treptower Park and the wide socialist boulevard of Karl-Marx Allee. But if there’s one difference with India where I think South Korea has the greater challenge, it is over territory. The cruel suffering of Kashmir — disputed by India and Pakistan with its own ceasefire line — may never be solved. But North Korea — whose people have been hermetically sealed, brainwashed and starved physically and spiritually for 60 years — is a challenge well beyond the East Germany that the Federal Republic absorbed in the 1990s. Unlike in Kashmir, it’s easy in South Korea to do a tourist daytrip from Seoul up to the demilitarised zone to peer across into The Other Side. You can even buy DMZ mugs and engraved golfballs. The commercial opportunities have not been missed. But the peninsula’s longterm future is a challenge almost unfathomable. So I haven’t got an answer to my question. But after a thoughtprovoking week in Seoul I am looking forward to my next visit to India to ask some more. 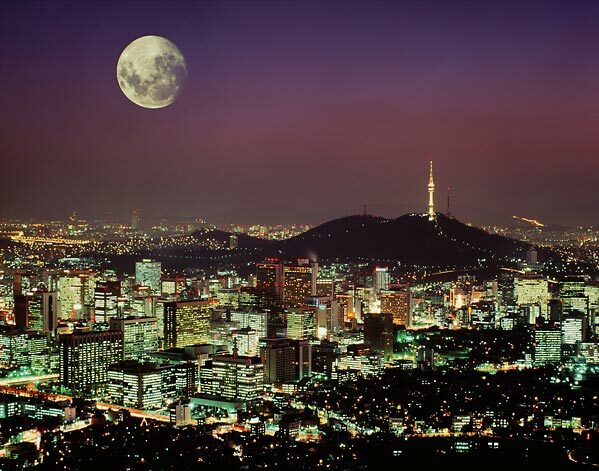 All photos (except moonrise over Seoul) are copyright: Samira Ahmed. No reproduction without permission. Korean street food. The next global big thing, says Tyler Brule. Lotte World. Pillaged by European Goths in search of inspiration. Kiddie Ride at Lotte World. Korea War Memorial photo op. Korea War Memorial display. Forget the 80s crackdown. Soldiers are officially fun. The Joseon Dynasty was Hot. Like The Tudors. I cannot begin to tell you how good these are. The shadow of Pyongyang: Gas masks on every subway platform. Need help buying subway tickets? Mascot alert. The Korean Police are officially cute. Scotland Yard take note. The appeal of burgers in the land of Korean cuisine remains a mystery. Korean traditions alive in the games arcade. This guy was SO good. Charles Ryder? In Cambridge? Oh, the Irony. You need this after eating weird foreign stuff like pizza. Further reading: Timely article in The Independent about fighting corruption in India. The Indian state of Manipur obsessed with Korean pop culture. This entry was posted in Culture, Politics, Travel, Uncategorized and tagged America, communism, India, indians, Korea, war. Bookmark the permalink.